In this hour-long class Hope Mielke will teach you how to start empowering your puppy to offer the behavior choices that work for both of you, including life skills like sit, down, leave it, come, focus, impulse control, and more. You'll also learn how to use various positive reinforcers, effectively socialize your puppy, and read the subtleties of body language so that you can better understand your puppy's communications with you. Of course, puppy essentials such as house-training, chewing, and learning to be gently restrained will be covered too! Lastly we hope to include some games, like Pass The Puppy, Musical Chairs, and the Best Of "Three Things I Love About My Puppy." 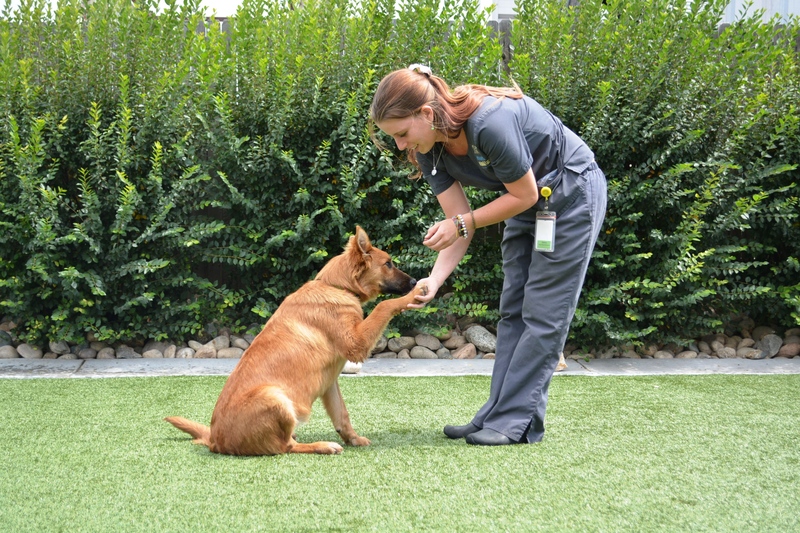 Each week we will work on behaviors, allow periods of well-supervised play, and have a Q & A session. We looking forward to empowering you and your puppy! Behaviors covered will be sit, down, coming when called, matwork, attention and beginning of loose lead walking. Puppies will have opportunity to play together under supervision with emphasis on learning to break away from distractions. Goals of this class are to start your puppy up the road to becoming a happy, focused, confident dog! Large Breed puppies up to 4 months old and Small Breed puppies up to 5 months are welcome! Get your baby dogs off to a great start in this all positive reinforcement class! We hope to see you! $150 - 7 weeks (1st week is puppy parents only) Click here for more info. This hour-long class is designed to continue your (6-12 month old) teenage puppy's journey to becoming the focused, confident dog you want him or her to be! Hope Mielke will teach you life skills like manners in public, door etiquette, loose lead walking, focus, focus, and more focus, socialization and surviving puberty positively, agility for confidence building, tricks for fun and focus, essential skills such as sit, down, come and leave it will be reviewed and new ones such as stay, emergency recall, heeling and more will be learned. Puppies up to 12 months old are welcome! Get your "high school" dogs off to a great start in this all positive reinforcement class! We hope to see you! Obedience training teaches your dog to come when called, proper social behavior around people and other dogs, and self-control. In our classes you will also learn how to stop behaviors that can damage your loving relationship with your dog and encourage those good behaviors which will bond you and your dog for life. Positive reinforcement dog training utilizes praise and rewards rather than punishment and corrections to teach dogs right from wrong. Treats, toys, praise and affection are used to REWARD your dog. Reward-based training allows for happy dogs, happy people and a strong and healthy relationship. Puppies are never too young to learn and older dogs are never too old to learn new behaviors. When your puppy starts going out in public, it is time to start class and teach him how to be a well-behaved community member. No interaction with puppies/dogs other than their own without owner permission.